This summer we’ve been enjoying so much wild salmon from the Community Supported Fishery that we are a part of. I’ve been experimenting with a bunch of different recipes (basically trying to find which one Charley will eat with the least amount of whining) and have found that this one that I have just barely adjusted from Practical Paleo by Diane Sanfilippo is simple, delicious, and great for repurposing leftovers the next day. I have a hunch that Charley might actually like it, although she would never admit it. I happily eat leftovers every day as a way to save time in the kitchen. When you cook absolutely everything from scratch, leftovers are a necessity. With that in mind, i reheated this salmon from last night’s dinner and added some simple zucchini noodles and red pepper, and it only took about 15 minutes of my time. Enjoy! 1) Preheat your oven on the low broiler setting. 2) Place some tin foil on a baking sheet and grease with coconut oil. 3) Place the salmon skin side down on your baking sheet and sprinkle with salt and pepper. 4) Sprinkle the chopped rosemary on the salmon, and top the salmon with the lemon slices. 5) Broil on low for approximately 10-15 minutes, depending on the thickness of your salmon. 1) Heat a large pan over medium heat and add 2 tablespoons of Tessemae’s Lemon Pepper sauce. 2) Fry your peppers for a few minutes until they begin to soften. 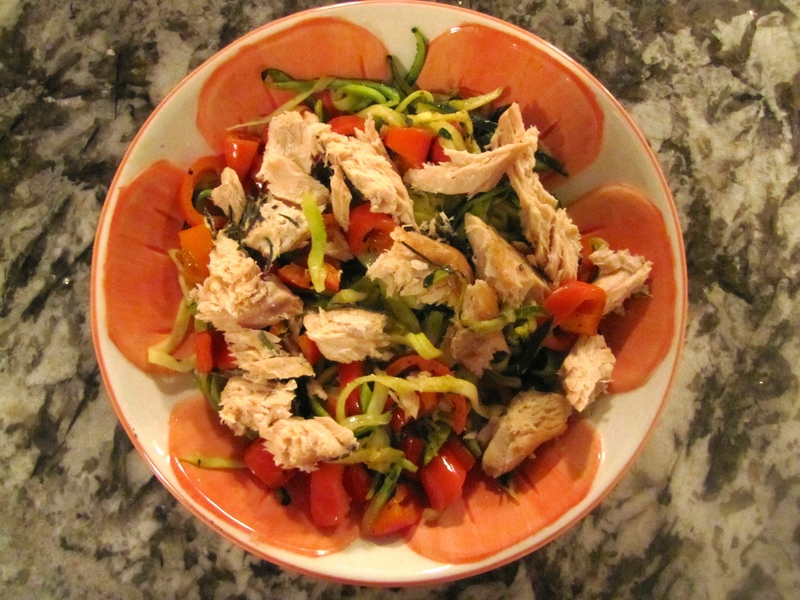 3) Add your zoodles and combine with the peppers. Fry for 4-5 minutes, until they are softened to your liking. 4) Remove and place in a bowl or on a plate. Top with your leftover salmon. Tessemae’s sauces are Whole30 approved and a great addition to your kitchen. They make dishes like this super quick and easy! You can order them online or find them at Whole Foods. Very useful information specially the ultimate section 🙂 I maintain such information a lot.